Village of Idiots struck a chord with me. And there is a pun in there, yes. Auto Reverse Theatre Company’s show about fatherhood is the very first show that I have ever seen that deals with the ups and downs of being a new dad. Or a dad many times over. Or an absent dad. Over the years the Fringe has seen many a show about motherhood – the joys and the conflicts that women face in their journey. Finally a show that opens up the other side of the discussion and luckily, it truly does it justice. The relationships in this show are so very real and well developed, as an audience member I felt instantly connected to their story. This show does what good improv does – it starts in the middle of the story. It is the story of three guys in a band who are also, as is often the case, best friends. As Luc and Jean smoke and drink, Patrick comes in. His wife has just given birth. The audience then joins in the emotional jam session as Jean and Luc each have very different riffs on how Patrick should handle fatherhood versus his dreams of traveling and music. I mention improv as well because the dialogue seems that natural. If you told me that these three guys where part of a band and we were watching them in their basement, I’d believe it. Standout Mark McIntyre deserves praise for making the opposing voice for most of the piece human, likable and real throughout his frustration. The scene where he talks openly about being in the delivery room for his wife’s caesarian section will stay with me. This play manages to go so much deeper than anything I have ever seen about fatherhood. It is about having kids – and being a present dad to them – and how it eventually changes friendships and alters the dreams you had for yourself. Ryan Turner and Craig Dean give solid turns as guys justifying trading fatherhood to live their dreams. There was a nice mixture of party and remorse as they tried to cling to their rock and roll lives. Dan Bell’s direction is solid. There is a lot of humour in this show, these are really funny guys that you’d love to hang out with, but Bell has directed it to add to the realism of the piece rather than going for the joke. 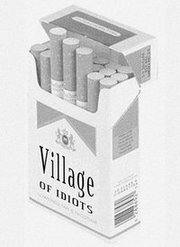 Village of Idiots runs till July 17h at the Robert Gill Theatre, 214 College St, 3rd floor.